Mateflex, one of the oldest U.S. manufacturers of modular sports tiles, offers two innovative modular surfaces for inline and ball hockey needs. Mateflex III is an open grid design for outdoor installations. It features smooth, flat ribs for optimum puck speed and fast skating properties. The design includes an integral expansion joint system that guarantees no court movement, from far northern climates to the tropics. A solid top version, Mateflex IIIS is also available for indoor applications. Made from the same tough material formulation, this product features a smooth solid top that resembles a real ice surface. SkateMaster inline skating surfacing products feature 100-percent acrylic resins to ensure long-term protection in all climate conditions. Attractive colors and specially engineered textures produce a surface that provides enjoyment and performance for years to come. From casual skating to the rigors of competitive inline hockey, SkateMaster provides an optimum surface. The nationwide and worldwide network of professional sport surfacing contractors is available to provide on-site recommendations and application services. Spider Tile is designed and engineered to be a true multipurpose sports floor. The goal has been to develop one floor for all uses that is performance-oriented as well as aesthetically pleasing and functional for every use. Spider Tile allows for relocation as required and provides a durable, energy-returning surface for all types of activities. From aerobics classes to roller hockey, basketball to child care, Spider Tile is an ideal surface. This highly developed system meets the DIN standard, providing 61-percent shock absorbency, which offers critical protection for knees and ankles during high-impact exercises. Choose from multiple color schemes. Roller hockey is a demanding sport for any floor. To address this, Sport Court, Inc. has designed DefenseTM , an ultimate flooring system for aggressive play and performance. DefenseTM , an industry leader in roller hockey, has been proven to deliver a better co-efficient of friction, less stake vibration and less puck chatter than many other floors of its kind. It is the official flooring for NARCH. DefenseTM is not only cost-effective and designed for multipurpose use, but it also allows portability and custom colors, while providing you with some of the best flooring in the industry. GamePlex is Athletica's completely portable, semi-portable or permanent rink system made of rotationally molded plastic. This versatile rink system was designed for indoor or outdoor use for inline hockey, ice hockey, indoor soccer, arena football, lacrosse and other sports. GamePlex Multi-Sport rinks offer excellent safety and game containment, as well as good ball and puck action off the boards. Intended for use with or without upper containment, this affordable rink system is easy to install and has virtually no maintenance requirements. The multipurpose sports flooring from Spider Court is scuff-resistant, durable, water- and moisture-resistant, easy to clean and maintain, totally hygienic, and able to retrofit over existing surfaces. With its innovative spider web design, Spider Tile provides 1095 PSI, making it one of the strongest available. Spider Tile is ideal for inline hockey, basketball, volleyball, soccer, aerobics, dance and many other applications. It is completely portable and, most importantly, gentle on your wallet. Athletes enjoy the playability of Spider Tile flooring, and facility owners appreciate its cost-effectiveness. The patented locking mechanism ensures tight seams, critical to floor stability and performance requirements. AmeriTile Indoor Sport is effective for inline hockey, indoor soccer, volleyball and any other multiuse facility. Players enjoy the smooth, comfortable feel, while the dense material and innovative construction reduce fatigue and injuries. The rubber underlayment absorbs sound and provides resilience, resulting in a surfacing system that can take a beating and improve acoustics. AmeriTile is available in 15 standard colors with custom colors available. 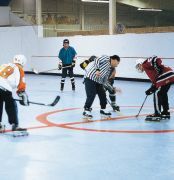 Aacer IceCourt is one of the only tiles designed specifically for inline hockey. The engineered tiles provide superior wheel grip and one of the fastest puck speeds available. Its interlocking loops form a tight fit creating a virtually seamless surface. Ice Court has been used in national and international tournaments for all age and ability levels and is the official supplier to AAU.